The question is a simple, yet powerful one. Are you selling your products Prime? If not, why?! It’s no secret that selling on Amazon FBA is one of the easiest, risk free ways to make money from home. But did you know that selling on FBA automatically enrolls your products into Prime listings? Yet another reason FBA is a sure win. 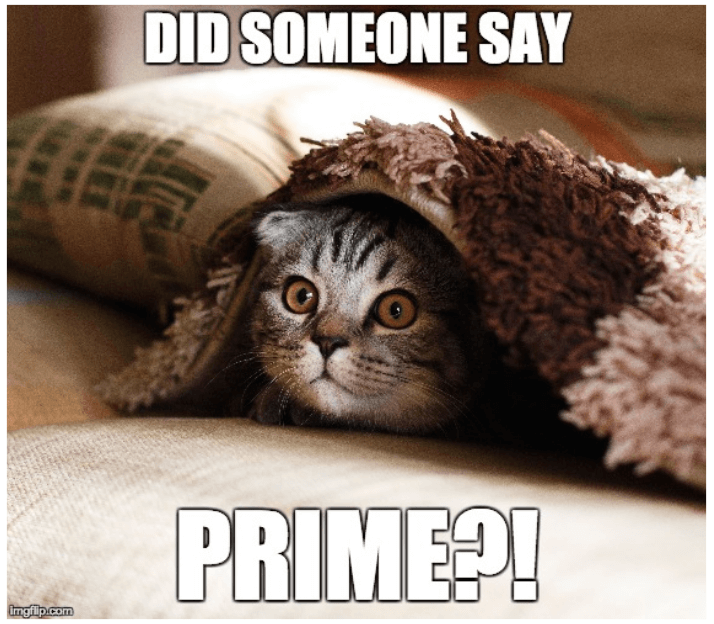 It would be easy for me to just end it there, but let’s look into this a bit more and understand why having your products qualified and selling Prime really does make all the difference, and if you’re not already, you’ll want to start selling Prime NOW! Amazon Prime, what is the big deal? It’s only once I understood what Amazon Prime is about and what it entails have I really been completely thrown by it. It takes a lot for me to rave about a service, trust me. Having worked in customer support roles for the past 6 years, I am all about the experience of a service and Prime has just blown me away. But not only by its features. Of course, they are awesome. I mean, same day delivery?! It doesn’t get much better than that…and it is only going to get better. 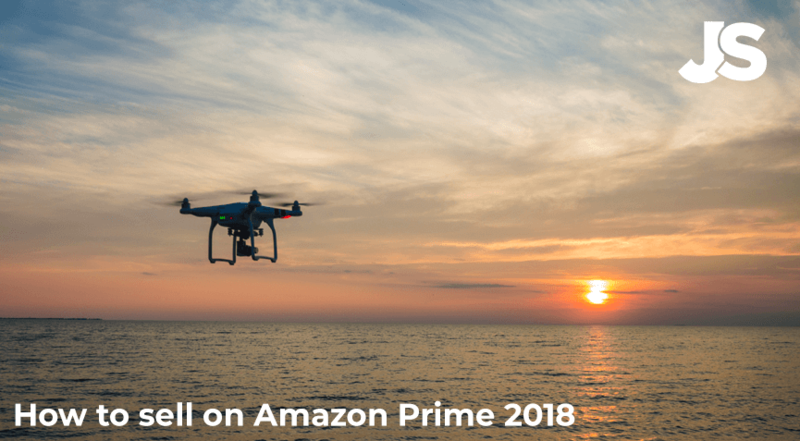 So, this may seem like an obvious one, but selling on Amazon Prime products automatically means that you have a devoted customer base, who are actively looking for Prime products at the touch of a button. 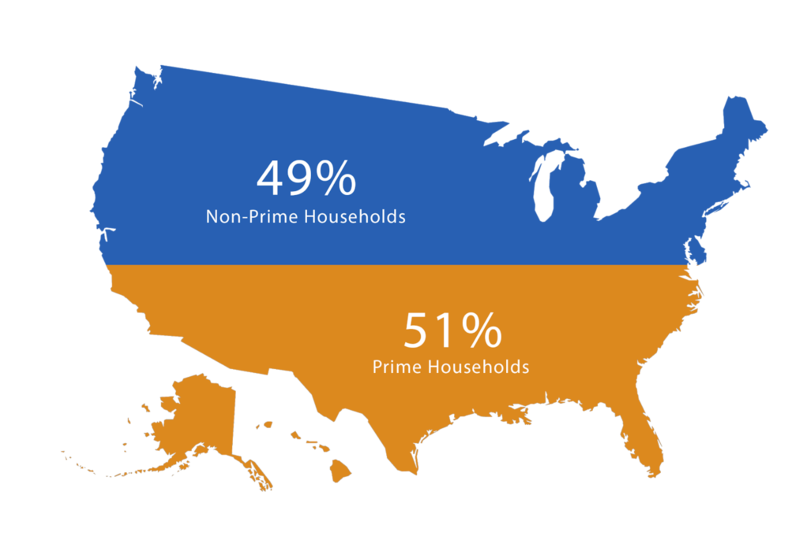 In fact, would you believe that 51% of US households are Prime users? 51%! That is unbelievable! 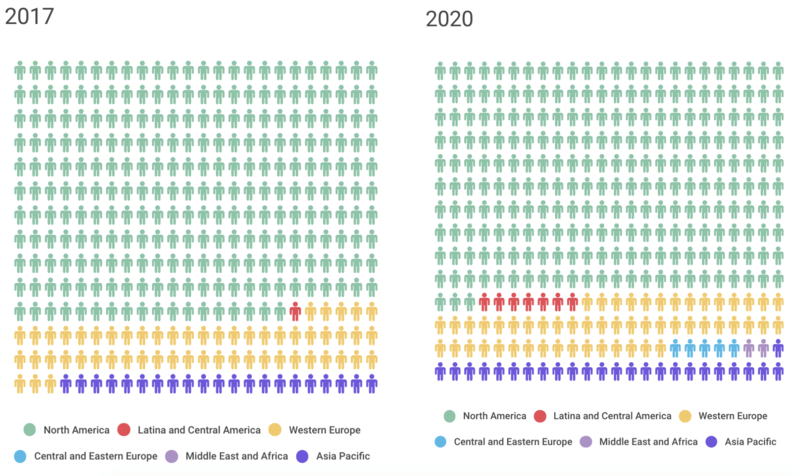 That means you are instantly targeting more than 90 million people in the states alone, and that’s not including the 60 million Prime customers worldwide. And to add on top of these stellar figures, these are ACTIVE users, so people who are actively buying on Amazon frequently. 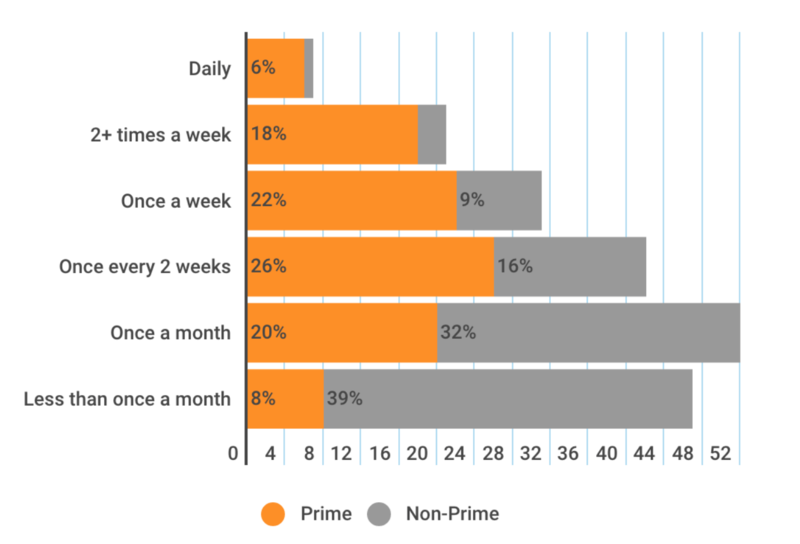 In fact, 6% of Amazon Prime users purchase something daily, compared to a “standard” Amazon user, which is only a mere 1%. So that’s 9,000,000 people buying everyday. That is basically every person in London buying something on Amazon Prime every single day. I think I may have got a tad too excited with numbers there, I just had to share. I was blown away as to how good of an opportunity this is and one you should definitely consider if you’re not already in the game. This also means that 18% of Prime customers buy at least twice a week. Then add the 26% every two weeks… which means that a staggering 138,000,000 people are buying on Amazon Prime every month. Again, this is why the Amazon Prime marketplace is such a great place to be selling. You have a dedicated audience who are purchasing daily, and who are consistently returning to make more orders. This is fantastic! In a “normal” ecommerce business situation, it is always a difficult game to get your customers to return to your store and purchase again. This is why so many people spend so much time on retention marketing. This isn’t even touching on how difficult it is to gain new customers. Which is why business owners spend SO much money on marketing. 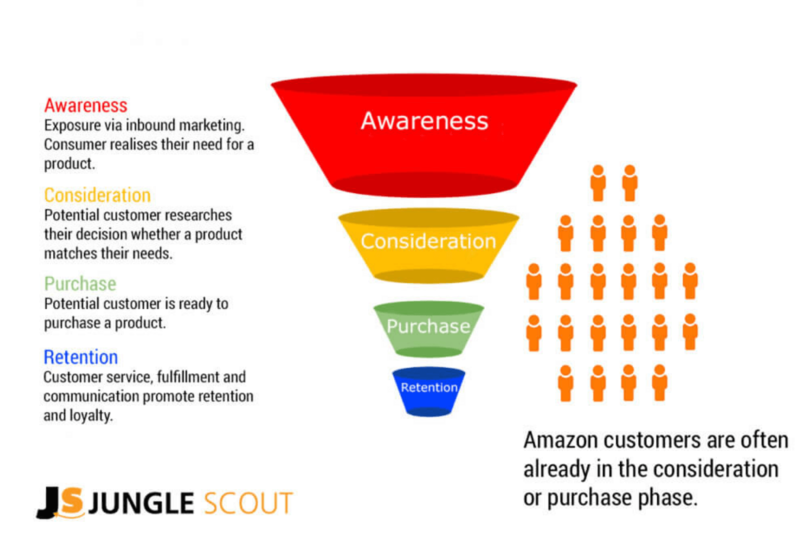 When you’re selling on Amazon, most of the marketing is done for you. People know Amazon. People trust Amazon. 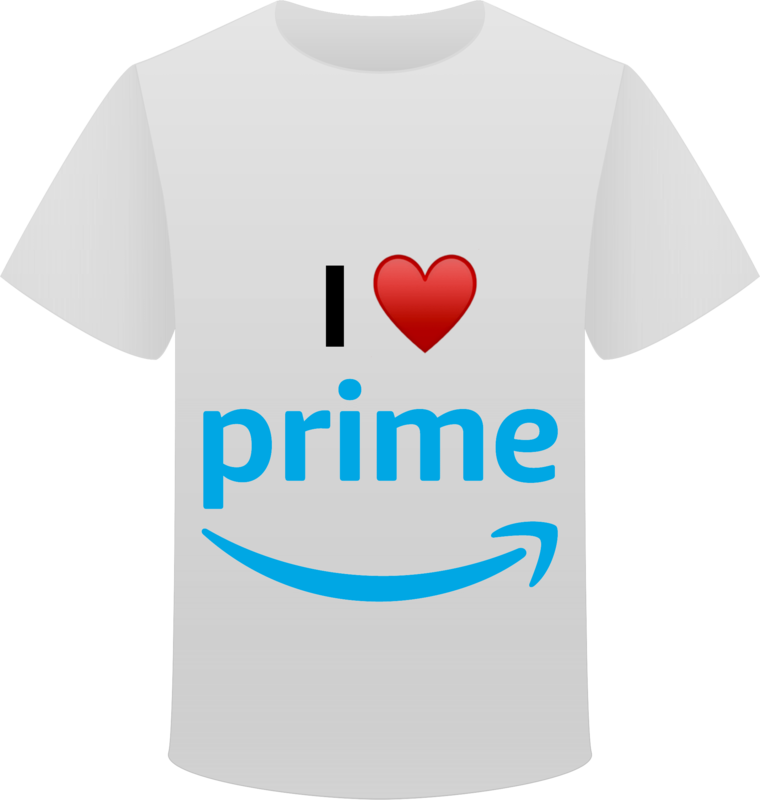 They already love Prime, as proven by the numbers and they are paying for the Prime service, meaning they will return and purchase again! This is awesome, as not only does it mean that Amazon is doing most of the marketing work for you, but it also means you save money. If you were selling elsewhere, you would need to have a large portion of money set aside to put towards marketing your product such as customer retention marketing, advertisement, paying influencers and creating customer loyalty programs (PRIME! ), just to name a few. It’s already done for you! Saving you so much money, which you can put towards the growth of your product, improving it or creating a new one. So, as long as you have done your product research correctly, there is absolutely no reason why your product should not be flying off the invisible shelves of your Amazon store and raking in a good profit. Paired with a dedicated customer base, minimal marketing expenses and needing little upfront investment compared to building your own e-commerce site (such as Shopify for example), why would you sell anywhere else? Make sure you find the perfect product to sell on Amazon by watching this video! After all those stats, let’s look at another reason why selling Prime products is a must. You will most likely see your sales boom. Yes, that’s right and you want to know why? People want their products now. Like NOW. No 3-4 days shipping? No thank you. Turns out, people no longer consider 3 days as a quick shipping turn around. People want their product in under 2 days. This is where Prime comes into play. Picture the scene. You’re sat on your phone after a long busy day at work. Kids are screaming. You’re tired. You’re simply looking for a new toy or something fun to perk up your week. You find the product, one is Prime eligible and one is not. Which one will you go for? Do you go another 3 or so days just waiting and waiting for it to arrive? Or do you select the option meaning you could get it tomorrow and have something new and exciting in your hands!? Is this really a question I need to ask? This is where Amazon really knocks it out of the park. We all know that Amazon is not the only place on the wild, wild web to purchase things. You have eBay, Shopify, and Etsy to name a few. Yet none of these platforms offers a service such as Prime and this is where Amazon sails past its competitors. You know the product you want. You can purchase it from all three online stores: Amazon, eBay and Shopify. With Amazon Prime it is eligible for 2 hour delivery. Let’s say the same product ordered on eBay takes 2 days and Shopify is 3. Not only that, but eBay wants $3.99 for shipping and Shopify wants $4.99. Amazon, on the other hand… free with Prime. Who would you purchase from? I know where I’d be clicking that add to basket button. We’re only human and that means we are impatient beings. If we can get our shiny, new product to our door on the same day or the next, then we’ll do it. 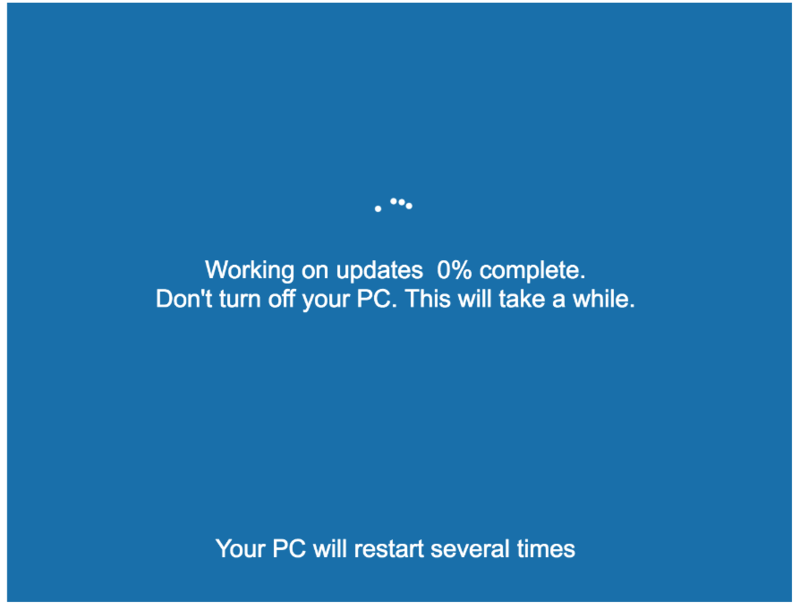 This is why having a Prime product means your product instantly gains over non-prime products. You have the quick sale. The upper hand. You straight away set yourself higher in the competition, which is great and with almost no hard work. Go you. How to sell on Amazon Prime? So you’ve heard all the stats and how Amazon Prime really is the place to be when selling your products, now you want to learn HOW exactly. There are two requirements to be eligible to sell your products under the Prime regime and those are that you must be selling on Amazon FBA and your seller metrics must be pretty damn good! Let’s have a look into this in a bit more detail. Yes, you must already be selling with Fulfilled by Amazon. That’s not too hard right? I mean, if I can do it, ANYONE can do it! It just takes some time and research to ensure you have selected the right product. Along with finding the right product, you should also select the right selling method for you. This could range from Online Arbitrage, where people purchase goods in bulk for a cheap price and sell them on for a marginal profit. They will also fulfil their orders themselves, meaning no Prime eligibility. You also have the Wholesale method. This is where you purchase items from a company at a discounted rate and you then sell on their behalf for a small profit. Now, you can sell via FBA using these methods, but the profits are often slim, and the product you are selling is not your own. You are working for someone else in basic terms and you have little control over the product and brand. This is why here at Jungle Scout advocate the private label method utilizing Amazon FBA. It eradicates all of the issues mentioned above, such as not having control, small profits, selling for another brand etc. You are in control, it is your brand, the profits are proven to be significantly larger in comparison and you choose, create and grow your business and product. And of course, it means you can access Amazon Prime. Secondly, to be able to offer Prime shipping, your Seller Metrics need to be pretty darn good. Ensure your product is a high quality – this helps keep returns low, and increases the chances of getting good reviews. You can utilize Amazon PPC campaigns to increase the visibility of your product in the Amazon search results, and increase your sales velocity. Offer stand out customer support to your customers (Jump Send is a great tool for this). 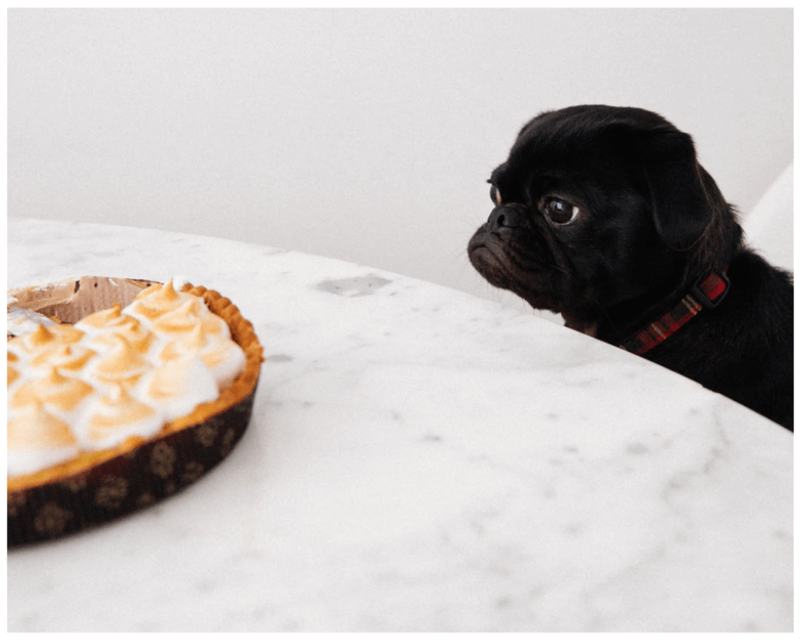 Make sure you keep track of your inventory – going out of stock causes your BSR (Amazon ranking) to drop, and this could potentially affect your eligibility when you relaunch your product. 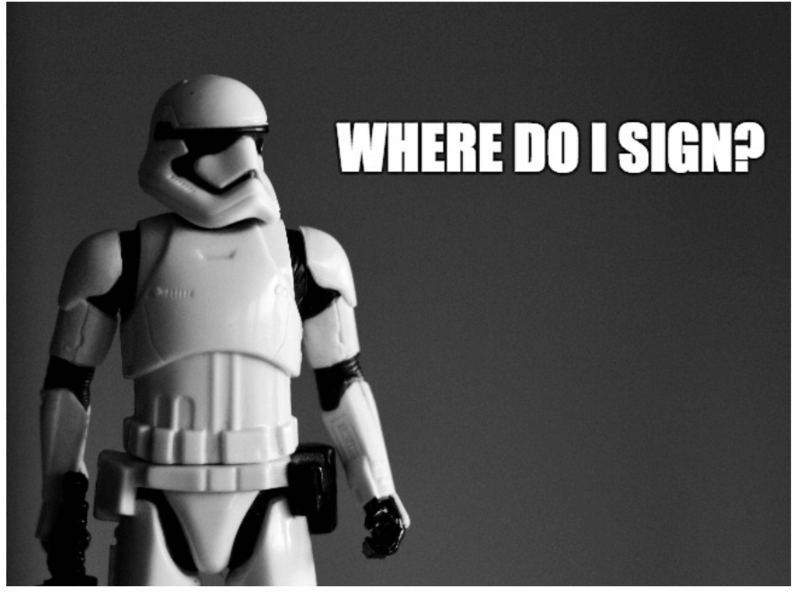 We hear ya, PPC can be confusing. So make sure you check out this video where we explain exactly How to set up a SUCCESSFUL Amazon PPC Campaign! But, what if I am a new seller? So if you are new to the Amazon game. Don’t worry. It may take a little while to become a fully fledged Prime seller due to your metrics building up. Just make sure you enter your niche with a great product (that has been well researched) and have a solid launch strategy. Is it worth the wait? Hell yeah. So be patient, becoming a Prime seller will benefit you in the long run. Wait a minute? What about Seller Fulfilled Prime? So you can be eligible for Prime if you do not sell via Amazon’s FBA program, however, this is something I would personally avoid and use FBA to its full advantage here. One of the main perks of FBA is that you get to take advantage of Amazon’s ability to get super quick shipping for a fraction of the price. If you are not using FBA, then the shipping costs will be drastically higher, especially if you are looking to ship next day or even compete with same day delivery. These costs will eat into your profit a considerable amount, which of course, nobody wants. When you are selling as a merchant, rather than Amazon fulfilled, you’ll need to store your own inventory. This can be a pain, as you’ll need your own warehouse, with staff, you will have to hire and you’d HAVE to ship Prime orders on the same day, which means your warehouse and staff would have to have super streamlined procedures. This is costly, and again, will eat into your profits. Why bother when Amazon can do all of this for you? Another reason why people love Prime is the customer service they receive and using FBA, Amazon provides 24/7 support for you. That’s right, you don’t have to lift a finger. They will deal with all of your returns on your behalf, whereas if you are fulfilling your own orders, you will need to take control of this yourself. This takes up a lot of time and effort, as you are expected to follow the same guidelines as FBA customer service, which are strict, purely down to Amazon wanting what’s best for the customer. We have written extensively about how to find a product to sell and launching it on Amazon. So I won’t get into the nitty gritty of how to sell on Amazon FBA right now, as we have tons of content on that already, here on our blog and YouTube channel, so head over there if you are interested in learning how to become a pro. Of course, you will need an investment to get started. Sellers have told us in the comments that this is often a barrier to entry. However, did you know that tools such as Kickstarter can be used to launch a product on Amazon?. Check out this blog post all about Kickstarter if you’ve never heard of it before, you WON’T regret it! You need some tools to help you along the way. The Jungle Scout Web App and Chrome Extension are your trusted sidekicks when it comes to finding the right product and minimizing the risk of failure. Finally, if you are looking for the right content to keep you going, our Genius Series is great as it covers everything YOU guys have told us you need help with and it’s 100% free, awesome right? So in order to be Prime eligible, you must be an FBA seller, utilizing Amazon’s fulfillment service to prep, pack and ship your inventory. So all in all, yes, that is all you need to be doing to qualify to sell Prime products and offer Prime shipping, that we know from the statistics above, people LOVE. a) Is proven to have an audience – a dedicated, active one at that of over 150 million people worldwide. b) Will boost your sales as you are targeting Prime customers, who pay for this service, which means they WANT to buy from you. c) You instantly gain on non-Prime sellers, cutting out the competition and being the go-to choice if there is a standard listing and yours is a Prime listing. THAT, my friends, is why selling Prime should not be an opportunity you pass up in a hurry. Are you a Prime Seller? If so, how are you finding it and the journey to get there? Or are you starting out and think Prime selling is going to be your goal? Let me know in the comments below and I promise I’ll reply! Hi. So I will pay just only FBA fees, right? I have a Amazon store and have an established business outside of Amazon already for years and want to sell my product on prime. What are the steps i need to take to do this? You didn’t mention anything about all of the sales tax liability you incur. You will have to file for a sales and use tax certificate in every state that Amazon has a warehouse. In addition, more states are now requiring that you also submit a yearly income tax filing with them. Other states charge franchise tax and entity taxes on top of everything else. Lots of fees, headaches, and more. Great point. When I started, I simply filed a sole proprietorship and later converted to an LLC, which, as far as I know, they still allow. Thank you for the insight. I was always wondering how did PRIME work, and today I learned a great deal. I’m brand new getting ready to launch my first product and definitely I will keep my eye on becoming a PRIME seller. Hi I’m a prime seller and it’s going pretty good. I just need to source this product more because it is flying off the shelf.